The English cottage is one of the most popular home styles around. It’s not difficult to see why. This style is romantic, cozy, and pretty. It brings to mind having a tea party with friends, or curling up in a comfortable chair with a Jane Austen book next to a table with freshly cut roses in a cut glass vase. If you like the idea of redecorating your home with cottage style home décor, read on for some tips on how to do this successfully. This style, though, can quickly start to feel dated and even overwhelming if you’re not careful. Here are some tips for incorporating the English cottage look in a balanced, beautiful way. You can give country cottage style a facelift by utilizing cool neutrals. For decades, people have simply used white as their canvas for the cottage style home. These days, though, designers recommend utilizing white, gray, and taupe – and not just alone. Using the colors together will give your room added elegance and modern appeal. You can accomplish this by painting the walls and ceiling white, while adding a gray headboard in your bedroom. Or you can add gray chairs, a taupe bench, and a rug that also incorporates those colors in your living room. A romantic space is perfect for reading a great piece of fiction and letting your mind wander to days gone by. If you have a window seat, add a comfortable cushion, as well as a plethora of pillows with floral designs. Even if you don’t have a window seat, though, you can still create a cozy corner for yourself. Put an overstuffed chair and ottoman in one corner of the room. Place a table nearby that’s big enough to put your book, a cup of tea, and a lamp on it. Don’t forget to add a cozy throw as well. You can store it in a basket next to the window seat, or drape it over your comfy chair. Not only will it look beautiful and add to your décor, it will keep you toasty warm while you read your favorite books. A country cottage reminds people of days gone by, days filled with travel and adventure. You can play up this theme by adding vintage pieces that could only be found during your favorite period in history. If you like the Jane Austen era, choose a silver comb and brush set to place on your bedroom dresser. What if you’re a fan of the early 20th century, a time in history when the British went on expeditions to faraway lands, like Egypt and India? 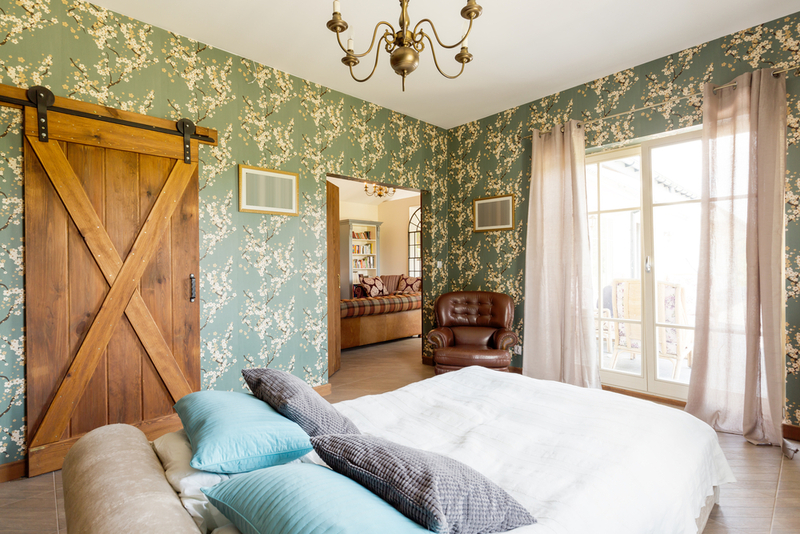 Add touches like vintage luggage to your English cottage style room. You can use these simply as decoration, or you can stack them and use them as a beautiful bedside table. One of the things that English cottages are known for is their flower gardens. They’re particularly famous for roses. A house without flowers is simply not a country cottage. Add fresh flowers throughout your house for a fresh look and delicious smell. Another way to add flowers to your home is to add floral pillows, couch slipcovers, or a bedspread. You can even go a step further and add floral touches with a carved tile kitchen island or floral wallpaper. Cottage décor is meant to make a room feel like the epitome of comfort. When you walk into a room, it should immediately feel like it’s the most comfortable room in the Universe. That’s why it’s so important to choose lighter colors with touches of darker colors. The lighter color will make you feel relaxed, but will also provide a sense of rejuvenation in that it allows you to let all of the worries of the day dissipate as soon as you walk into the room. When you’re searching for the right piece of furniture or accent pieces, really think about how the piece makes you feel. Does it feel somewhat heavy or constricting? If so, you might want to keep looking until you find the perfect piece. Are you due for a remodel? If so, why not considering taking some of your inspiration from cottage style homes? For fans of old fashioned romance, cottage style homes are the ultimate in beautiful home design. The great thing about cottage décor is that you can add newly made pieces or vintage accents that will leave you daydreaming about the era that they’re from. When it’s time to do some home redecorating, consider giving in to your romantic side and adding some country cottage accessories.